In this material dimension gravity is the weight being pulled to an object. So we consider earths gravity at 1.0 and its because of this that we are standing upon the surface instead of floating in space. But in the spirit gravity is what we accumulate, if we seek adventure, excitement, material gain, possessions. If we want what others have and wish to take them our gravity is increased. In this way when we die we drop down into a dimension that has even more of this to offer. But if we seek peace, harmony, and do not attach our-self to anything physical we are lighter and we go up to a dimension that has more of what we seek. Some of us may think we are very light but in truth we weigh tons. So in this reality we know gravity is weight of density and in the spiritual it is weight of want. So spiritual gravity is the pull of our nature to the place that offers us the most of what we seek. Some it is more material less spiritual, others seek more spiritual less material. So spiritual gravity is what we attach our self to. This article is about the natural phenomenon. For other uses, see Gravitation (disambiguation). "Gravity" redirects here. For other uses, see Gravity (disambiguation). "Law of Gravity" and "Laws of Gravity" redirect here. For other uses, see Law of Gravity (disambiguation). Hammer and feather drop: Apollo 15 astronaut David Scott on the Moon recreating Galileo's famous gravity experiment. (1.38 MB, ogg/Theora format). Gravitation or gravity is a natural phenomenon by which all physical bodies attract each other. Gravity gives weight to physical objects and causes them to fall toward one another. 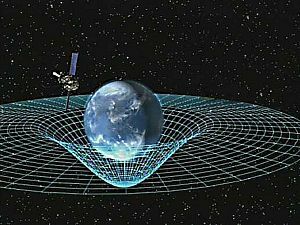 In modern physics, gravitation is most accurately described by the general theory of relativity (proposed by Einstein) which describes gravitation as a consequence of the curvature of spacetime. For most situations gravity is well approximated by Newton's law of universal gravitation, which postulates that the gravitational force of two bodies of mass is directly proportional to the product of their masses and inversely proportional to the square of the distance between them. In pursuit of a theory of everything, the merging of general relativity and quantum mechanics (or quantum field theory) into a more general theory of quantum gravity has become an area of active research. It is hypothesised that the gravitational force is mediated by a massless spin-2 particle called the graviton, and that gravity would have separated from the electronuclear force during the grand unification epoch. Gravity is the weakest of the four fundamental forces of nature. The gravitational force is approximately 10−38 times the strength of the strong force (i.e. gravity is 38 orders of magnitude weaker), 10−36 times the strength of the electromagnetic force, and 10−29 times the strength of the weak force. As a consequence, gravity has a negligible influence on the behavior of sub-atomic particles, and plays no role in determining the internal properties of everyday matter. On the other hand, gravity is the dominant force at the macroscopic scale, that is the cause of the formation, shape, and trajectory (orbit) of astronomical bodies, including those of asteroids, comets, planets, stars, and galaxies. It is responsible for causing the Earth and the other planets to orbit the Sun; for causing the Moon to orbit the Earth; for the formation of tides; for natural convection, by which fluid flow occurs under the influence of a density gradient and gravity; for heating the interiors of forming stars and planets to very high temperatures; for solar system, galaxy, stellar formation and evolution; and for various other phenomena observed on Earth and throughout the universe. This is the case for several reasons: gravity is the only force acting on all particles; it has an infinite range; it is always attractive and never repulsive; and it cannot be absorbed, transformed, or shielded against. Even though electromagnetism is far stronger than gravity, electromagnetism is not relevant to astronomical objects, since such bodies have an equal number of protons and electrons that cancel out (i.e., a net electric charge of zero). Modern work on gravitational theory began with the work of Galileo Galilei in the late 16th and early 17th centuries. In his famous (though possibly apocryphal) experiment dropping balls from the Tower of Pisa, and later with careful measurements of balls rolling down inclines, Galileo showed that gravitation accelerates all objects at the same rate. This was a major departure from Aristotle's belief that heavier objects accelerate faster. Galileo postulated air resistance as the reason that lighter objects may fall slower in an atmosphere. Galileo's work set the stage for the formulation of Newton's theory of gravity. A discrepancy in Mercury's orbit pointed out flaws in Newton's theory. By the end of the 19th century, it was known that its orbit showed slight perturbations that could not be accounted for entirely under Newton's theory, but all searches for another perturbing body (such as a planet orbiting the Sun even closer than Mercury) had been fruitless. The issue was resolved in 1915 by Albert Einstein's new theory of general relativity, which accounted for the small discrepancy in Mercury's orbit. Although Newton's theory has been superseded, most modern non-relativistic gravitational calculations are still made using Newton's theory because it is a much simpler theory to work with than general relativity, and gives sufficiently accurate results for most applications involving sufficiently small masses, speeds and energies. The equivalence principle, explored by a succession of researchers including Galileo, Loránd Eötvös, and Einstein, expresses the idea that all objects fall in the same way. The simplest way to test the weak equivalence principle is to drop two objects of different masses or compositions in a vacuum and see whether they hit the ground at the same time. Such experiments demonstrate that all objects fall at the same rate when friction (including air resistance) is negligible. More sophisticated tests use a torsion balance of a type invented by Eötvös. Satellite experiments, for example STEP, are planned for more accurate experiments in space. The Reissner-Nordström solution, in which the central object has an electrical charge. For charges with a geometrized length which are less than the geometrized length of the mass of the object, this solution produces black holes with two event horizons. The prediction that time runs slower at lower potentials has been confirmed by the Pound–Rebka experiment, the Hafele–Keating experiment, and the GPS. The prediction of the deflection of light was first confirmed by Arthur Stanley Eddington from his observations during the Solar eclipse of May 29, 1919. Eddington measured starlight deflections twice those predicted by Newtonian corpuscular theory, in accordance with the predictions of general relativity. However, his interpretation of the results was later disputed. More recent tests using radio interferometric measurements of quasars passing behind the Sun have more accurately and consistently confirmed the deflection of light to the degree predicted by general relativity. See also gravitational lens. Gravitational radiation has been indirectly confirmed through studies of binary pulsars. General relativity predicts that light should lose its energy when travelling away from the massive bodies. The group of Radek Wojtak of the Niels Bohr Institute at the University of Copenhagen collected data from 8000 galaxy clusters and found that the light coming from the cluster centers tended to be red-shifted compared to the cluster edges, confirming the energy loss due to gravity. In the decades after the discovery of general relativity it was realized that general relativity is incompatible with quantum mechanics. It is possible to describe gravity in the framework of quantum field theory like the other fundamental forces, such that the attractive force of gravity arises due to exchange of virtual gravitons, in the same way as the electromagnetic force arises from exchange of virtual photons. This reproduces general relativity in the classical limit. However, this approach fails at short distances of the order of the Planck length, where a more complete theory of quantum gravity (or a new approach to quantum mechanics) is required. Every planetary body (including the Earth) is surrounded by its own gravitational field, which exerts an attractive force on all objects. Assuming a spherically symmetrical planet, the strength of this field at any given point is proportional to the planetary body's mass and inversely proportional to the square of the distance from the center of the body. g = 9.80665 m/s2 (32.1740 ft/s2). This means that, ignoring air resistance, an object falling freely near the Earth's surface increases its velocity by 9.80665 m/s (32.1740 ft/s or 22 mph) for each second of its descent. Thus, an object starting from rest will attain a velocity of 9.80665 m/s (32.1740 ft/s) after one second, approximately 19.62 m/s (64.4 ft/s) after two seconds, and so on, adding 9.80665 m/s (32.1740 ft/s) to each resulting velocity. Also, again ignoring air resistance, any and all objects, when dropped from the same height, will hit the ground at the same time. It is relevant to note that Earth's gravity doesn't have the exact same value in all regions. There are slight variations in different parts of the globe due to latitude, surface features such as mountains and ridges, and perhaps unusually high or low sub-surface densities. According to Newton's 3rd Law, the Earth itself experiences a force equal in magnitude and opposite in direction to that which it exerts on a falling object. This means that the Earth also accelerates towards the object until they collide. Because the mass of the Earth is huge, however, the acceleration imparted to the Earth by this opposite force is negligible in comparison to the object's. If the object doesn't bounce after it has collided with the Earth, each of them then exerts a repulsive contact force on the other which effectively balances the attractive force of gravity and prevents further acceleration. The force of gravity on Earth is the resultant (vector sum) of two forces: (a) The gravitational attraction in accordance with Newton's universal law of gravitation, and (b) the centrifugal force, which results from the choice of an earthbound, rotating frame of reference. At the equator, the force of gravity is the weakest due to the centrifugal force caused by the Earth's rotation. The force of gravity varies with latitude and increases from about 9.780 m/s2 at the Equator to about 9.832 m/s2 at the poles. Ball falling freely under gravity. See text for description. Under an assumption of constant gravity, Newton's law of universal gravitation simplifies to F = mg, where m is the mass of the body and g is a constant vector with an average magnitude of 9.81 m/s2. The acceleration due to gravity is equal to this g. An initially stationary object which is allowed to fall freely under gravity drops a distance which is proportional to the square of the elapsed time. The image on the right, spanning half a second, was captured with a stroboscopic flash at 20 flashes per second. During the first 1⁄20 of a second the ball drops one unit of distance (here, a unit is about 12 mm); by 2⁄20 it has dropped at total of 4 units; by 3⁄20, 9 units and so on. Under the same constant gravity assumptions, the potential energy, Ep, of a body at height h is given by Ep = mgh (or Ep = Wh, with W meaning weight). This expression is valid only over small distances h from the surface of the Earth. Similarly, the expression for the maximum height reached by a vertically projected body with initial velocity v is useful for small heights and small initial velocities only. The discovery and application of Newton's law of gravity accounts for the detailed information we have about the planets in our solar system, the mass of the Sun, the distance to stars, quasars and even the theory of dark matter. Although we have not traveled to all the planets nor to the Sun, we know their masses. These masses are obtained by applying the laws of gravity to the measured characteristics of the orbit. In space an object maintains its orbit because of the force of gravity acting upon it. Planets orbit stars, stars orbit Galactic Centers, galaxies orbit a center of mass in clusters, and clusters orbit in superclusters. The force of gravity exerted on one object by another is directly proportional to the product of those objects' masses and inversely proportional to the square of the distance between them. In general relativity, gravitational radiation is generated in situations where the curvature of spacetime is oscillating, such as is the case with co-orbiting objects. The gravitational radiation emitted by the Solar System is far too small to measure. However, gravitational radiation has been indirectly observed as an energy loss over time in binary pulsar systems such as PSR B1913+16. It is believed that neutron star mergers and black hole formation may create detectable amounts of gravitational radiation. Gravitational radiation observatories such as the Laser Interferometer Gravitational Wave Observatory (LIGO) have been created to study the problem. No confirmed detections have been made of this hypothetical radiation. In December 2012, a research team in China announced that it had produced measurements of the phase lag of Earth tides during full and new moons which seem to prove that the speed of gravity is equal to the speed of light. It means that if the Sun suddenly disappeared, the Earth would keep orbiting it normally for 8 minutes, which is the time light takes to travel that distance. The team's findings were released in the Chinese Science Bulletin in February 2013. Extra-fast stars: Stars in galaxies follow a distribution of velocities where stars on the outskirts are moving faster than they should according to the observed distributions of normal matter. Galaxies within galaxy clusters show a similar pattern. Dark matter, which would interact gravitationally but not electromagnetically, would account for the discrepancy. Various modifications to Newtonian dynamics have also been proposed.